Many feel that the three hardest words to say are: “I am sorry.” Yet, we all know how very important those words are. Indeed, saying one is sorry, or at least admitting one’s guilt, is a critical part of the process of teshuvah, repentance. Equally important, however, is the ability to hear someone else’s apology and to accept it. Even greater is the ability to forgo an apology altogether and simply forgive the person for hurting you. Jewish tradition teaches that one is only obligated to ask for forgiveness three times. After three refusals, the person is no longer held accountable for their misconduct, as he/she has demonstrated true regret. The one who will not accept a sincere apology after three requests for forgiveness is now guilty of bearing a grudge. What is wrong with bearing a grudge against a person who really hurt you? Beyond the fact that it is a violation of a Torah prohibition (Leviticus 19:18), bearing a grudge affects the person psychologically. A person bearing a grudge is, in general, less happy with the world and with other people because he/she cannot get past the feeling that he/she was wronged. Forgiveness, on the other hand, is rather easy to bestow. And when it is done with sincerity, it is as much a gift to ourselves as it is to the person we forgive. *This Treat was last posted on August 27, 2013. In situations where you feel you were wronged, try to examine the situation from the other person's perspective. A great deal of the wedding seems to focus on the bride. In fact, it is not uncommon to hear of a wedding referred to as “her day.” In Jewish tradition, however, there is one wedding-oriented event that is specifically celebrated in honor of the chatan, the groom. The actual day of the event, however, depends on whether one is Ashkenazi or Sephardi. Among Ashkenazim, it is customary for the chatan to celebrate his aufruf, as it is known, on the Shabbat before the wedding (although circumstances sometimes cause the aufruf to be held two Shabbatot before the wedding or at one of the weekday Torah reading services). Aufruf is the Yiddish term for being called up for an aliyah, when the chatan makes the blessing over the reading of the Torah. Among the Sephardim, the honor of a special aliyah to the Torah is reserved for the Shabbat after the wedding. This Shabbat is referred to as the Shabbat Chatan. The primary purpose of both the aufruf and the Shabbat Chatan is that the chatan receives an aliyah to the Torah. Different synagogues have different customs on how this honor is celebrated. Often the family of the chatan will sponsor a kiddush (generally a festive buffet following the Shabbat morning service) in honor of the chatan. In some congregations, it is customary to throw candy (or sometimes nuts or raisins) at the chatan. Make an extra effort to enjoy the peace of Shabbat. The Torah verse that epitomizes the emotion of love is: “Anee l’dodi v’dodi lee” - I am to my beloved, and my beloved is to me (Song of Songs 6:3). The ideal love relationship according to the Torah is one in which both parties are willing to give themselves to their chosen partner. The Hebrew acronym for the verse Anee l’dodi v’dodi lee is “Elul,” the name of the Hebrew month that precedes Rosh Hashana. When speaking of Rosh Hashana, the sages discuss the great sense of awe that one must feel. They do not, however, mean awe as in fear. Rather, they mean awe as in a sense of reverence, of being overwhelmed by the greatness of God. The purpose of Rosh Hashana is not simply to make people feel guilty for their mistakes or promise to do better (although that too is important), but, as with much of Jewish life, it is to help develop each individual’s relationship with God. In many rabbinic allegories, the Jewish people are likened to a bride while God is portrayed as the waiting groom. The Jewish people (both as individuals and as a nation) can gain the most by recognizing that God loves His people and wishes to bring blessing upon their homes. "I am to my beloved, and my beloved is to me." When “I” (meaning the Jewish people) can truly give to “my beloved” (meaning God), then God will become ours in a beautiful and Divine partnership. This Treat was last posted on August 13, 2013. Take some time to think about how you allow yourself to experience God's presence. When Charles Fleischmann (1835-1897) and his brother Maximilian (1846-1890) came to America (Cincinnati, Ohio), they were shocked and dismayed at the quality - or lack thereof - of American bread. The reason for the coarse, dense loaves was a lack of yeast, which lead to the use of homemade starters. Back in Vienna, Charles had managed a distillery that produced spirits and yeast, so the Fleischmann brothers knew exactly what they needed to do. After finding a financial backer, James Goff, they established a yeast plant in Cincinnati. Their compressed yeast cake was a success and had a tremendous impact on American baking, both at home and commercially. To launch their product, the Fleischmann brothers opened a concession stand, “The Model Vienna Bakery,” at the 1876 Centennial Exposition in Philadelphia, PA. Soon, Fleischmann’s yeast became a household name. In addition to yeast, the Fleishmanns became one of America’s major producers of vinegar and the country’s first commercial gin maker. To enhance their products, Charles Fleischmann invented and held the patent to numerous pieces of machinery necessary for yeast production. The company, which remained in the family until it was acquired by Nabisco in the 1980s, continued to grow and expand even after the passing of its founder. In 1900, Fleischmann’s opened a research facility in Peekskill, NY. Later, as part of the war effort during World War II, the Fleischmann’s company invented the still popular dry-active yeast that did not need to be refrigerated. On your next shopping trip, buy some honey for your Rosh Hashana challah. Today, August 25th, is the anonymously anointed “Kiss and Make Up Day.” These modern “holidays” have little historic meaning, but Jewish Treats would be remiss in not noting that the "holiday" falls within the Hebrew month of Elul. Elul begins the 30 day countdown to Rosh Hashana, the New Year. Rosh Hashana is also Yom Ha’din, the Day of Judgment. On the first of Tishrei, God judges the world as a whole, each nation and each individual, and determines what will be their fate in the year to come. As a preparation for the Day of Judgment, Elul is a time of teshuva,repentance--an opportune time for self-reflection and making amends. In fact, it is more important that a person put things right between him/herself and his/her fellow human than asking God for forgiveness for any particular sin against Heaven. While “kiss and make up” is a cute way of expressing this very important process of creating peace between people, teshuva is a serious and meaningful process. One should not seek forgiveness unless one really is sorry for what was done. This Treat was last posted on August 25, 2011. Begin repairing relationships with those close to you by making it a point to apologize rather than assume all will be forgiven. The story of the Jewish people is one of wandering, exile and redemption. It is therefore not surprising that many items precious to Jewish life have followed similar paths. An excellent example is the Aleppo Codex. The Aleppo Codex, which is also known as Keter Aram Soba (The Crown of Aleppo), was written in the 10th century. This reference tome contains both proper vowelling (a Torah scroll has no vowels) as well as the Masoretic cantillation marks of Aaron ben Asher, for the Tanach (Pentateuch, Prophets and Writings). In the 11th century, the Codex was purchased by the Karaite community of Jerusalem. When the Crusaders conquered Jerusalem (1099) however, they held the holy works they had seized for ransom. Among these was the Aleppo Codex, the ransom for which was paid for by the Karaite community of Cairo. In Egypt, many respected scholars, including Rabbi Moses ben Maimon (Rambam/Maimonides), consulted the Codex. It remained in Cairo until the 14th century, when it was brought to Aleppo, Syria and kept in a special cabinet in Aleppo’s Central Synagogue, where it remained for over 500 years. Sadly, in 1947, rioters burned down the synagogue in protest of the United Nations agreement to partition Palestine. Ten years later, due to the great heroism of a Syrian Jewish cheese maker named Murad Faham, the Codex (which had mostly survived the fire) was smuggled to Jerusalem. In the holy city, it became the possession of the Ben Tzvi Institute. In the 1980s, it was put on display in the Shrine of the Book at the Israel Museum. While the Codex is now safe, its arrival in Israel was not without controversy. Some say that the Codex was never meant to go to the Institute but to the Syrian Jewish community in Jerusalem. Additionally, the Aleppo Codex is no longer complete. The Israel Museum has only 294 of the 487 pages (most of the Pentateuch is missing). While it was believed that the missing pages were destroyed in the fire, a few (very few) of the missing pages have since reappeared. If you have old Jewish books, treat them with care so that they may be preserved for the future. Psalm 27 is read twice daily from the beginning of the month of Elul through the holiday of Sukkot in order to help each Jew develop a beautiful relationship with the Divine. “One thing have I asked of God, one thing do I desire: that I may dwell in the house of God all the days of my life, to behold the graciousness of God, and to visit in His Temple” (27:4). This poignant phrase is an expression of the true longing that is reflected in this psalm. While one may look to God as a protector and a savior (which, indeed, is how God is referred to through much of this psalm), it is critical to also seek out God and to try to be close to Him. Psalm 27 was written by King David, who certainly did not have an easy life (King Saul wanted him dead, his sons rebelled...), and yet King David remained steadfast in his faith in God. With all his troubles, David had the incredible gift of being able to look at the world and recognize the ways in which God protected him. “Had I not believed that I would look upon the goodness of God in the land of the living!--Hope in the Lord; be strong, and let your heart take courage; yea, hope in the Lord" (27:13-14). The month of Elul, which leads into Rosh Hashana, is a time for reflecting on the wonderful gift of having a relationship with the Divine--and how one can work to achieve that relationship. This Treat was last posted on August 27, 2014. Take the time to carefully read through Psalm 27 in your primary language. As the new school season begins, be supportive of your local Jewish education institutions. In the early Middle Ages, the global Jewish community was basically divided between those living in lands controlled by the church and those in lands controlled by the Arabs. The dominant cultures in which they lived affected both the customs and the language of Jews in those countries. Many of the greatest Jewish scholars of this era actually wrote in Arabic or Judeo-Arabic. The language disparity between the Jewish communities gave rise to a unique group of scholar - translators. Among this group there was one fascinating family - the ibn Tibbons. The patriarch of this translating clan was Judah ben Saul ibn Tibbon. A Jewish physician from Granada, he left Muslim controlled Granada in the mid-twelfth century after persecution had begun, and relocated to Lunel in southern France. There, Judah taught his sons the art of translating, and they went on to attain wide renown. Samuel ben Judah is best-known for translating Maimonides’ Guide to the Perplexed from Arabic to Hebrew. His work of translation later had to be defended by Samuel’s son Moses and his grandson Judah against those who found the philosophical work of Maimonides heretical. Jacob ben Machir ben Judah ibn Tibbon (1236-1304) was, perhaps, the most famous of the ibn Tibbon family. In addition to translating many works of scientific and philosophical subjects, he was also an astronomer of great note. In Provence, France, he was called Don Pro Fiat Tibbon, in Latin Profatius Judaeus. Jacob created an astronomical quadrant (a type of astrolabe) and an astronomical table beginning in 1300. The ibn Tibbons not only helped cross the divide between Jewish communities, they also were instrumental in bringing the ancient knowledge of the Greeks and Romans back to Western society. These works had been translated from Greek to Arabic, and the Jewish translators then translated them to Hebrew, making them accessible to be translated to Latin. Look for Jewish books at used bookstores and garage sales. New beginnings are often difficult. No other beginning is quite as profound as the one we face annually at Rosh Hashana. During the High holidays, God gives all people the chance to face His judgment and wipe their slate clean. Looking honestly at one's actions and resolving to make changes to one's life is a daunting task. Just as in the morning, people naturally desire to continue sleeping and not wake up at what feels like the crack of dawn, most people wish to roll over and bury their heads back in the blanket rather than face the challenge of change. 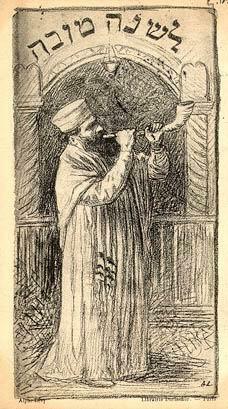 The great symbol of Rosh Hashana is the shofar. Knowing well the nature of people, the sages realized that what was really needed was an "alarm clock." They therefore instituted the custom of blowing the shofar every morning during the month of Elul, the month preceding Rosh Hashana. When the shofar is sounded in the synagogue, it is meant to serve as an alarm clock that awakens our souls and reminds us that Rosh Hashana is soon at hand. This Treat was last posted on Monday, August 27, 2014. Take a few moments and think about the things you want to "wake up" and improve upon. Selma Stern-Taeubler (1890-1981) was a natural achiever. Not only was this doctor’s daughter the first woman to be accepted to Baden-Baden’s Gymnasium in Germany, she even graduated from there with honors. A natural scholar with a penchant for history, Stern-Taeubler continued her studies at the University of Heidelberg and earned her doctorate from Maximilian University of Munich in 1913. Following the First World War, Stern-Taeubler realized that, as a Jew, she would never have a proper place in Germany. At the same time, Stern-Taeubler recognized that a large portion of German Jewry was losing its connection to, and understanding of, Jewish life and practice. Stern-Taeubler became a research assistant at the newly opened Akademie Fur Die Wissenschaf des Judentums (Academy for Jewish Studies) in Berlin. Stern-Taeubler thus began an academic career that enabled her to write her three volume masterpiece: The Prussian State and the Jew. The work began with the Jews of the 18th century, but, with the growing anti-Semitism that she recorded, it became abundantly clear that the Germany in which Stern-Taeubler had been raised was rapidly disappearing. When Stern-Taeubler and her husband, Eugen Taeubler - himself a research scholar at the Wissenschaf des Judentums - were denied library access, they knew it was time for change. After salvaging as many documents as they could, the Taeublers headed for the United States. Arriving in Cincinnati, Ohio, the Taeublers sought to continue their Jewish scholarly activities and soon joined the staff of the Hebrew Union College - he as a teacher, she as the first archivist of the American Jewish Archives. During her first years in America, Stern-Taeubler produced her only novel, The Spirit Returneth (title of translated novel) about the Jewish community in Europe at the time of the Black Death (14th century). Eugen Taeubler died in 1956. In 1960, Stern-Taeubler retired from the Archives and moved to Basel, Switzerland. She continued her research and writing until her death on August 17, 1981. Investigate the history of different Jewish communities. In the last decade, the nation of Pakistan has frequently been in the news, all too often connected to reports of violence, bloodshed and war. Pakistan itself is actually a very young country - it was created when it was separated from India on August 14, 1946. At the time of the creation of Pakistan, there were approximately 2,000 (reports vary between 1,500 and 2,500) Jews living there, the majority in the city of Karachi. These Jews had, for the most part, come from India and were members of the Bene Israel community. Despite having only one synagogue, Magain Shalome, built in 1893, the Karachi Jews were able to successfully build their community during the first half of the 20th century. A Young Man’s Jewish Association was established and there was a special fund, the Karachi Bene Israel Relief Fund, to support poor Jews. The Jewish community was accepted enough within the city that Abraham Reuben became a councilor in the Karachi City Corporation in 1936. Life for the Jews of Pakistan began to change not long after it became an independent country, and Israel moved toward its own independence. In 1948, Pakistani rioters, opposed to the creation of the State of Israel, attacked the synagogue. Many of the Pakistani Jews left, heading first to Bombay and from there to Israel, Canada, and the United Kingdom. Similar violence recurred during each of Israel’s wars, and the Jews of Pakistan continued to flee. Those who remained hid among the general population. On July 17, 1988, the Magain Shalome Synagogue was destroyed by presidential order so that a shopping mall could be built on the site. The Jewish cemetery remains and is maintained by local non-Jews. If the weather permits, enjoy a nice Shabbat walk. Few people famous for their Torah learning have as colorful a background as Rabbi Simon ben Lakish, who is frequently referred to in rabbinic literature as “Reish Lakish.” Before dedicating himself to Torah study, Reish Lakish was a bandit and a gladiator. jumped into a pool of water in which Rabbi Yochanan was bathing. Amazed at the skillfullness and distance of his jump, Rabbi Yochanan told Reish Lakish that his unusual strength should be used for Torah study. Reish Lakish responded in kind, suggesting that Rabbi Yochanan’s beauty (for he was exceptionally handsome) should be for women. Rabbi Yochanan immediately proposed that, if Reish Lakish would repent from his outlaw ways and become a scholar, he could marry Rabbi Yochanan’s sister, who he said “is more beautiful than I” (Talmud Baba Metzia 84a). As Rabbi Yochanan had suspected, when Reish Lakish focused his strength on Torah, he was able to achieve uncommon greatness. One scholar, Rabbi Ulla, said of him, “One who saw Reish Lakish in the study hall would think he was uprooting mountains and grinding them against each other” (Talmud Sanhedrin 24a). In time, Reish Lakish came to equal Rabbi Yochanan in scholarship, and the two became study mates, although they were often at odds in their opinions. The two sages studied together until tragedy struck. One day, a group of sages were trying to determine the ritual status of an assortment of knives. Reish Lakish and Rabbi Yochanan had differing opinions, and the latter muttered, “A robber understands his trade,” a not-so subtle allusion to Reish Lakish’s shady background. Reish Lakish responded by pointing out how he was a master in his former life and a master in his current life. Rabbi Yochanan felt himself deeply hurt. Realizing how severely he had pained his brother-in-law, Resh Lakish was so upset that he himself became ill and died. Following his death, a grief stricken Rabbi Yochanan was so inconsolable that he eventually lost his mind (Baba Metzia 84a). Don't doubt your abilities to make changes in your life. It’s a classic ethical dilemma: Two people are lost in the desert with only one water bottle. There is not enough water for both people to reach civilization. Who gets the water, or do they share it (and both die)? Let’s be honest, most people run through all the answers in their head. The natural instinct of “Hey, it’s my water” is beaten down by every lesson on sharing and sacrificing for others. But the altruistic response of giving all of the water to the other person goes against basic survival instinct. Sharing the water seems to leave open the possibility that the two people might find more water or come across someone who will rescue them and transport them to civilization. The sages (Talmud Baba Metzia 62a) were divided regarding the correct response. Ben Petura believed that the correct solution was to share the water. His reasoning, however, was that sharing the water and both dying was better than either of them living and watching the other die. After all, doesn’t it say in Talmud Sanhedrin 74a: “Who says your blood is redder? Maybe your friend’s blood is redder?” Meaning, how can an ordinary human being choose who lives and who dies? On the other hand, Rabbi Akiva, whose opinion is the accepted one, declared that the owner of the water is the one who should drink the water. As proof, he cited Leviticus 25:36, which states: “That your brother may live with you.” While this verse is actually part of a discussion on usury, Rabbi Akiva cited it to answer our question. He noted that the Torah said “with you,” to teach us that while in most instances you must help your brother. This is not so if it comes at the expense of your life! Therefore, the owner of the water gets to keep it. This Treat was last posted on May 6, 2010. When traveling or hiking, make certain to bring enough supplies for emergency situations. Is there any truth to the popular statement, “What goes around, comes around”? It is a pithy phrase that is all too often suggested (somewhat viciously) after a person falls on hard times. Hardship occurs and suddenly everyone points to that person’s flaws and finds a way to connect those flaws to that person’s current difficult situation. Rabbi Hiyya responded by citing the School of Rabbi Ishmael, where it was taught, “It is a wheel that revolves in the world” as an explanation to Deuteronomy 15:10, “Because that for this thing [ the Lord your God will bless you in all your work, ”which uses the Hebrew word bi’glal, going around to mean “for this thing”] (Shabbat 151b). The Talmud provides one more citation to explain this concept: “It was taught, Rabbi Gamaliel Beribbi said: ‘And He shall give you mercy, and have compassion upon you, and multiply you’ (Deuteronomy 13:17). [This means that] he Who is merciful to others, mercy is shown to him by Heaven, while he who is not merciful to others, mercy is not shown to him by Heaven” (ibid). People will often try to second guess how the “wheel” works, but the fact of the matter is that no person can truly see into the lives of others. The person who was a miser could well have been the anonymous donor to the orphanage and the person who helped with every wedding could be taking a little off the books. Knowing, however, that one’s own choices can effect one’s future (and even the future of one’s children) is a helpful reminder of the power of one’s actions throughout one’s life. Do not keep a mental tally of how kind, generous and/or compassionate you have been. Can Torah be studied every day? While there are many Jews who can and do study Torah daily, there are just as many who cannot, due to a wide variety of reasons ranging from lack of time to lack of accessibility. Responding to this challenge, when the Men of the Great Assembly created the structured prayer service, they made one of the first elements of the morning prayer service a section entitled "Blessings over the Torah." There are, in fact, two blessings, the latter of which is the same blessing that is recited when a person is called to the Torah for an aliyah. The first blessing addresses the mitzvah of “occupying ourselves with the words of Torah” and expresses the desire that the words of Torah should be “pleasant in our mouths”so that our connection to the Divine will remain strong. The second blessing acknowledges that God chose the Jewish people to receive the gift of the Torah. Because the first blessing is a blessing over the action of the mitzvah of studying Torah, the sages made certain that the mitzvah would be immediately fulfilled (just as an apple is eaten right after reciting the blessing boray p'ree ha’etz). Consequently, immediately after these two blessings are uttered, a person recites one selection of Written Torah and two readings from the Oral Torah. May God shine His face toward you and show you favor. May God be favorably disposed to you and grant you peace. (1) These are the things for which there is no measure: the corner of the field [that is left for the poor], the first-fruits offering, the pilgrimage, acts of loving-kindness, and Torah learning. (2) These are the things for which a person reaps the fruits in this world, and gets a reward in the world to come: honoring one's father and mother, early attendance at the house of study in the morning and evening services, hospitality to guests, visiting the sick, providing for a bride, escorting the dead, absorption in prayer, and bringing peace between people. And the study of Torah is equal to them all. Include a little Torah study into your day. As beautiful as Shabbat is, it was not God’s intention that humankind live in a constant state of Shabbat. Indeed, it has been understood that because the Torah says, “Six days you shall work and on the seventh day you shall rest,” that it is actually a mitzvah to do creative work on the non-Sabbath days. Additionally, there are numerous mitzvot which one may not perform on the Sabbath. Shabbat officially ends at the time of the appearance of three medium-sized stars in the sky, but only completely concludes (spiritually) with the recitation of Havdallah. “...The sons of Rabbi Hisda said to Rabbi Ashi: Amemar once visited our town: lacking wine, we brought him beer, but he would not recite havdalah [over it], ‘and passed the night fasting.’ The next day we took trouble to procure wine for him, whereupon he recited havdalah and ate something...This proves three things;  even one who recites havdalah in the evening service must recite havdalah over a cup;  a person must not eat until he has recited havdalah; and  he who did not recite havdalah at the termination of the Sabbath proceeds to recite havdalah any time during the week” (Pesachim 107a). The time between the recitation of the evening service* at the end of Shabbat and the recitation of havdallah is therefore an intermediate time when one may perform m’lacha (creative work) but may not eat. If one cannot perform havdalah on Saturday night, they may recite it the next day (as some do in the time zones where Shabbat ends exceptionally late) or even several days later (through Tuesday), although this is not considered ideal. *One who does not attend or recite maariv, the evening service, may simply recite“Baruch ha’mavdeel bein kodesh l’chol,” "Blessed is he who separates between the holy and the mundane” after the time when three stars would appear in the sky. M’lacha (creative labor) is then permitted but food may not be eaten. This Treat was last posted on October 8, 2010. Before Shabbat, make certain you have wine/grape juice, spices and an appropriate candle for Havdallah. In honor of Bolivia’s declaration of independence from Spain on August 6, 1825, Jewish Treats presents a history of Jews in Bolivia. Jewish history in Bolivia begins in the days before it was Bolivia, when the region was still part of the Viceroyalty of Peru. At that time, as in many parts of South America, the original European settlement consisted of many Marranos, Jews who kept their identity a secret while pretending to be Catholic. While there are remnants of Jewish culture, such as a custom of sitting on the ground during mourning, the original Jewish settlers faded away when the Inquisition was established in 1570. Bolivian Jewish history does not begin again until the early 20th century with the arrival of small groups of Jews. One Alexandrian immigrant, Isaac Antaki, opened a large textile factory in the city of Cochabamba and helped establish a Jewish community and built a synagogue. Outside of Bolivia’s capital, La Paz, and in addition to Santa Cruz, Cochabamba is one of the few Bolivian places that maintains a Jewish community to this day. Major Jewish immigration to Bolivia did not take place until the 1930s, with the rise of the Nazis to power in Europe. At first, thousands of Jews were allowed into the country, many of them aided by Maurice Hochschild, a Jewish immigrant who had made his fortune in Bolivian tin mines. By 1939, as in many countries, public sentiment had turned against open immigration (and the government against Hochschild, who was imprisoned both in 1939 and in 1944). Although immigration was closed to Jews as of 1940, small groups did manage to enter the country. Following the war, economic conditions led many of the Jewish immigrants to emigrate to other countries, but a small Jewish population remains in the three cities mentioned above. Be aware of the many different Jewish communities around the world and their trials and triumphs. I shall give you in the end’ [i.e. after death]. Whence [can this be inferred]? From what we read in our text,’And it shall come to pass, because (eikev) you listen’ (Deuteronomy Rabbah 3:1). 2) When the Children of Israel fully comply with God’s ways and do complete teshuva (repentance), God will reverse the power of Esau’s descendents (generally referred to as Edom) over the Children of Israel. ...God said: “When everything is ready [for Israel's] repentance, then I will tread with the heel of my foot on the winepress of Edom.” When will this be? “And it shall come to pass, because (eikev) you listen.” God said to Israel: “My children, do not think that I desire to treat you like a slave whose master desires to sell him at an auction for what he may fetch, but I will go on allowing hardship to come upon you until you direct your heart toward Me” (Deuteronomy Rabbah 3:2). When reviewing the weekly Torah reading, try to review the writings of different commentators. When Rabbi Yaakov Culi arrived in Constantinople, Turkey, in 1714, he did not expect to find a Jewish community lacking Jewish knowledge. While the city was home to some of the great Torah scholars of the generation, the general Jewish populace had recently been devastated by the betrayal of the false messiah, Shabbetai Zvi (1626 - 1676). Born in Jerusalem in 1689, the 24 year old Rabbi Culi had traveled to Constantinople in order to publish the works of his late grandfather, Rabbi Moshe ibn Habib. He became a student of the Chief Rabbi of Constantinople, Rabbi Judah Rosanes, who appointed Rabbi Culi to serve as a judge on the beit din (Jewish court). In 1727, after Rabbi Rosanes passed away, his house was pillaged and any manuscripts that were not destroyed were left scattered across the house. Rabbi Culi thus embarked on his second publishing project: organizing and printing the work of his mentor (including Rosanes’ Mishneh la-Melek commentary on the Maimonides’ Mishneh Torah). Once Rabbi Culi completed publishing the works of his grandfather and his teacher, it was expected that he would release a work of his own original insights. Instead, he set himself to creating an encyclopedic work that would reinvigorate Sephardic Jewish life. Writing in Ladino (a Judeo-Spanish language), Rabbi Culi set out to create a unique commentary on the Torah. Each chapter interpolated with explanations from the Mishna, the Talmud, the Midrash, the Zohar and popular commentaries, as well as extensive explanations of Jewish law. He named his work Me’am Lo’ez and finished this work on the Book of Genesis and most of Exodus before his unexpected passing on 19 Av, 1732. The Me’am Loez was so popular, however, that several contemporary scholars decided to use his notes to continue Rabbi Culi’s work. Rabbi Yitzchak Magriso completed the Me’am Loez commentaries on Exodus, Leviticus and Numbers. Rabbi Yizchak Bechor Agruiti completed the commentary on Deuteronomy. Several other rabbis used his notes and style to create commentaries on several other biblical books and Pirkei Avot/Ethics of the Fathers. When a Jewish topic interests you, don't hesitate to research it. There are few moments in life as full of anticipation and hope as that of bringing new life into the world. The excitement of the nine months of pregnancy can also be laced with anxiety. In fact, traditional Jews will often wish an expectant couple “b’sha'a tova” (in a propitious time) rather than Mazal Tov, which is reserved for after the birth. It is, therefore perhaps, not surprising that there are several Jewish segulot (auspicious omens or acts) for expecting parents. Segulot are not replacements for prayer, which is the most effective way to communicate one’s needs to God. But, for some, it serves as a means of helping people focus their prayers by providing a concrete action. Psalms and Charity: According to Jewish tradition, the recitation of Psalms and the giving of charity are spiritual remedies for nearly every trouble. However, both of these acts are frequently cited as segulot that are specifically helpful to pregnant women. In particular, it is recommended that Psalm 20 be recited, especially during labor. Opening the Holy Ark (Peticha): Sources for this custom date back only a few hundred years, and yet it is now a fairly common custom. When a woman enters her ninth month, the husband is given the honor of opening the ark (cabinet in which the Torah scrolls are stored) as a segulah for her to have an easy delivery. Never hesitate to add a friend and his/her need to your prayers.